‘Beyond the Streets’ brings room-filling installations and street art history to L.A.
Worldwide icon-chevron-right North America icon-chevron-right United States icon-chevron-right California icon-chevron-right Los Angeles icon-chevron-right ‘Beyond the Streets’ brings room-filling installations and street art history to L.A.
That’s largely the credo of this massive street art exhibition on the edge of Chinatown, which collects works from over 100 international artists whose practices started as ambitious acts of vandalism and have now worked their way into the studio. Of course, there are still plenty of big-ticket names at “Beyond the Streets”—Takashi Murakami, Shepard Fairey, Banksy, Invader and RETNA, among them—but curator Roger Gastman boasts that every single piece on display has come directly from the artist rather than private collections. The exhibition’s scope is staggering, in both its 40,000-square-foot layout and its comprehensive survey of graffiti, from scrawled text on freight trains and subway cars to the sort of genre-defying, room-filling installations near the gallery’s exit. Yes, many visitors will inevitably make a beeline past the photos of early wall writers in favor of colorful, Insta-friendly backdrops, but “Beyond the Streets” does an admirable job of interspersing bits of history—including large-scale recreations of a Lee Quiñones handball court and the tagged up Venice Pavilion—among displays of street art’s future. 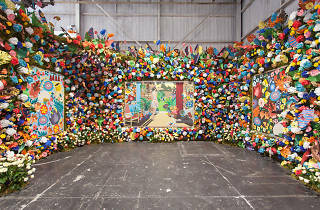 As for those spectacle pieces, they certainly leave an impression: A 40-foot-tall double-sided curtain covered with Murakami paintings encourages visitors to closely inspect its perimeter while a partially-destroyed classical temple by FAILE beckons visitors inside with playful, satirical reliefs and a horseman statue. 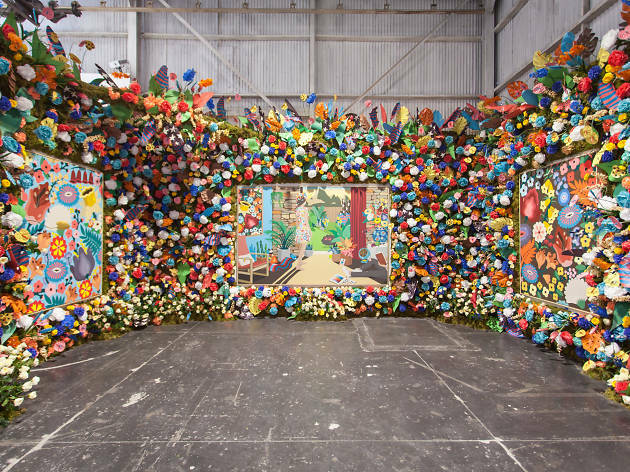 The show saves one of its finest pieces for last: Duo DabsMyla have covered an entire corner with a whimsical floral wall and a trio of paintings. Sure, a string of corporate sponsors, a gift shop with “Cool S”-emblazoned merch and a museum-like $25 admission fee may run counter to the exhibition’s claims of rebellion, but “Beyond the Streets” is an exhaustive survey of the ambitious heights artists can reach through both ephemeral works on the street and indelible installations. “Beyond the Streets” runs May 6 through July 6 at Werkartz (1667 N Main St). Timed tickets (Tue–Sun noon–7pm) cost $25, though a number of free admission days will be announced later this month.